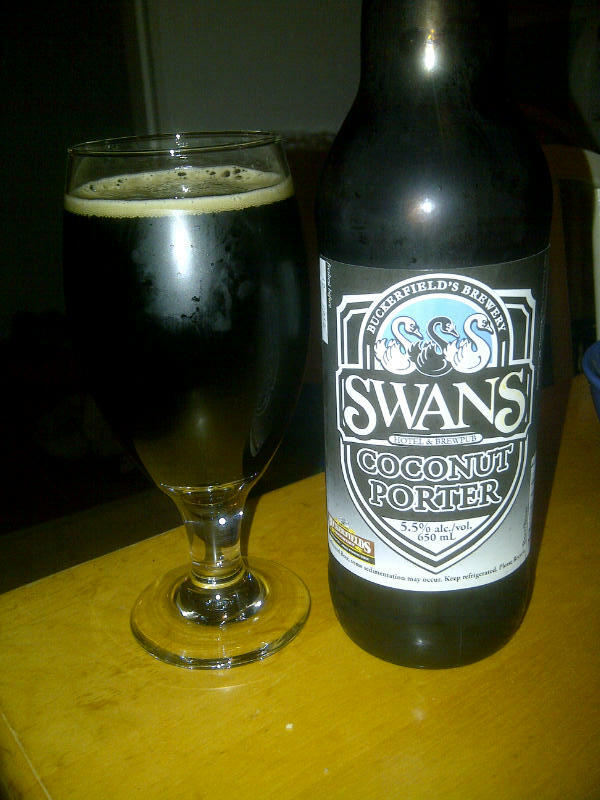 From Swans Buckerfields Brewery in Victoria BC comes their “Coconut Porter”. The porter pours a deep brown colour with a tan head. The aroma of the beer is of roasted malts, chocolate and as the name suggests coconut. The flavour of the beer goes even further than the aroma with roasted malts, chocolate, coconut, some espresso and a mild hops bitterness. I am glad I found a bottle of this as it was a very nice porter! The alcohol content of the beer is 5.5%. This entry was posted in Porter and tagged bc, beer, canada, chocolate, coconut, espresso, hops, malts, malty, porter, roasted malts, swans, swans brewpub, victoria.